Buttin'Heads Dairy Goats were started by Tom & Sue Rucker and our son, Eric, who also had his own herd of purebred Oberhasli and Nigerian Dwarves for which he used the herdname Buttin'Heads Too. In 2004, following a house fire that left the previous home uninhabitable, we purchased a new (to us) farm near Marengo, Ohio which is about 30 minutes north of Columbus. Year pass and changes occur. In 2005 Tom and Sue split up. We continued to co-own the herd, but Tom and the Oberhasli moved about a half an hour north to near Galion, while the Nigerian Dwarves remained with Sue and Eric in Marengo. In 2007, after obtaining his Associate' s Degree, Eric moved out to pursue a career in computers. 2011 saw another major change as Sue passed away unexpectedly. Tom moved back to the farm in Marengo and combined the two breeds into one herd again. Buttin'Heads started in 1991 with the purchase of "a couple of goats for the backyard." During the height of the kidding season the caprine population reaches around a hundred, but we try to maintain a milking string of 25-30 adult does. We strive to breed the all-around dairy goat, placing equal emphasis on milking ability, conformation and temperament. We were on continuous DHIR test from 1993 to 2002 to prove the milking ability of our animals. Our goal has never been to be number one in production, but to have animals that milk well in relation to their size. We have been fortunate to have one Oberhasli and several Nigerians obtain Breed Leader (Top Ten) status. Unfortunately, due to the expense and the inability to retain a tester, the herd was not on DHIR test since 2002 until 2011 when finally arrangements were made to return to DHIR test where 15 of the 20 does tested earned their AR/*M. Those that didn't were all first fresheners. 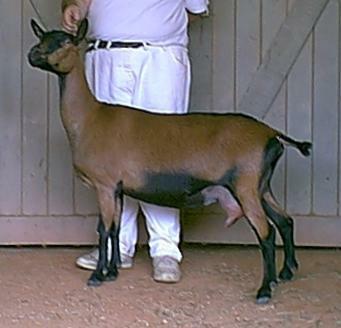 The herd is exhibited at shows throughout the area and to date we have had at least 17 Nigerian does, 15 of them homebred, complete their American Goat Society Master Championships including four different doe lines having three generations of Master Champions with one line now with the fourth generation. As all but three of these does have also met the minimum requirements in milk production for Advanced Registry status, they now carry the prefix of ARMCH before their names. We've had an AGS National Junior Champion doe and had the BOB doe for both preview rings at the 2003 AGS National show. Since ADGA acceptance in 2005, 33 does we've bred have finished their ADGA Championships with 11 of those does being GCH and 4 SGCH. In addition, at least 8 of those does have earned at least 30 all-breed Senior Doe or Combined Doe Best in Show awards. There have been several BIS Junior Doe wins as well. Although we rarely show bucks as we feel their value is better determined by the success of their daughters, we did have the 1997 AGS National GCH Nigerian buck, 2 ADGA permanent Champion Nigerian buck with 4 others owned by others finishing and at least two are multi-BIS winning bucks, and 1 Oberhasli ADGA multi Best in Show winning buck. We have also had 26 homebred Oberhasli does (7 CH, 5 GCH and 14 SGCH) and 1 Experimental complete the requirements for their American Dairy Goat Association Championships. There have been 2 Experimental and 5 Oberhasli senior does garner BIS wins with 3 Oberhasli getting a Best Udder in Show. We have several more animals in both breeds with legs toward their permanent championship status and are hopeful that we'll be adding to the ranks of permanent champions in the the herd soon. In 2012, the herd made the trip to Colorado for the ADGA National. The Oberhasli had a very respectable showing with several 2nd and/or 2nd udder placements in their classes. The Nigerians, though, really shined. Not only was the herd honored with the National Grand Champion, Best Udder and Total Performer but also Reserve National Grand Champion and winning both the Dairy Herd and Best 3 Senior doe classes (the only 2 groups entered) as well as being named Premier Breeder for the Nigerian Dwarf breed. In 2016, the Nigerians had a respectable showing with 5 animals shown and none placing less than 4th with two 2nds with udder placements. Seven Oberhasli seniors were shown with one doe placing below 4th (8th) including a class winner, and 5 udder placements including two firsts, one of which went on to be named Best Udder for the breed. The herd was further honored with both Premier Breeder and Premier Exhibitor for the Oberhasli breed. As you navigate through the site, you'll find I don't give the usual "glowing" descriptions of the goats you find on many other sites. I realize that no animal is perfect, so rather than bore you with my view of the animals, you are provided with pictures, pedigrees, linear appraisal scores and milk and show records and allow you to reach your own conclusions. Of course, if you have questions about specific animals, I'll be glad to provide you with additional details.